Revamp your old cushions by covering divine cushion covers. There is no easier and less expensive way to refresh your living space and bedroom than by updating your cushions. It is the great way to embrace the outlook of your couches, sofas, chairs and many more things. Cushion covers placed in the chair or on a sofa can change the view of the entire space. Buy cushion covers online from swayamindia which have the charm to create that pop of colors you need in your space. Placement matters when it comes to decorative cushion covers, therefore always try to organize the set of cushions in a proper position. The coordinating pattern, pretty contrasting and neutral color will definitely create a new look in your space. The innovative designs is so striking that it would atomically bring a smile on everyone’s face from teens to old. You can create more comfortable seating on bean bags or on wooden chairs. Try to arrange your cushion covers in angled layers across the back on one side. Cushions always give the flexibility as it easily changes the look of your home. 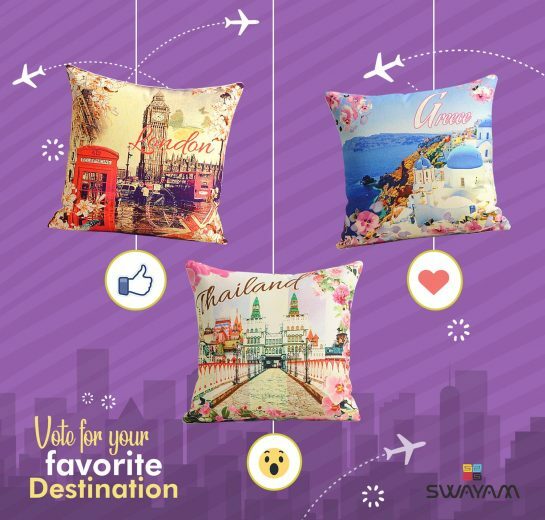 Get cushion cover online through online shopping from the house of swayam and make your living space very special where you will love to chill out with your family, guest and friends. The classy look of the covers will definitely reflect your living standard in front of your guests. If you want to add the essence of fun in your home and want to experience the change then visit the website of swayamindia.com. The fusion color and the superb design will enlighten up your mood. It is easy to maintain as it needs a simple machine wash with a mild detergent.